CRD101 Cafe Racer, the model that we are going to review in this post complies with the standards we have set, in terms of brand personality. It is a striking and stylish bike, which has been restored with the usual precision, characterized by a deep respect for the donor bike. 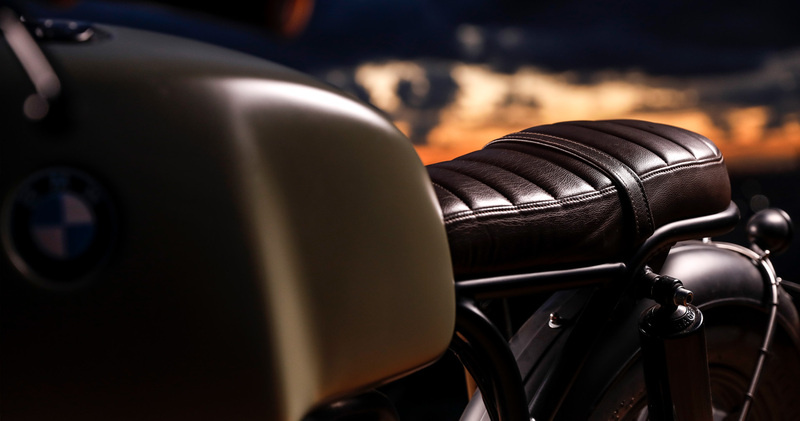 The main sign of identity of our creations is the respect for the essence of the motorcycle we are restoring. But being respectful with that essence does not stop us from giving fresh air to each bike we restore, to make them more in line with our creative style and brand image. Customers who have already trusted Cafe Racer Dreams know that our personality is solid and shines through in every job we do. They trust our criteria because they want a vintage-style motorcycle that maintains that classic, retro look. A motorcycle that looks as new and shiny as the day it left the factory. Keep reading if you want to know more about CRD101. 1978 was a crucial year for Spain. On December 6, 1978, the Spaniards ratified the current Spanish Constitution by referendum. Therefore, for our country this year was marked not only the change from dictatorship to democracy but also the transition to modernity. This modernity that was endorsed by the transformation in the tastes of the Spaniards, who were getting closer and closer to the prevailing trends and styles in the rest of Europe. In 1978, despite the World Cup held in Argentina, the sport of motorcycling caused a furor in Spain. Ángel Nieto’s successes made motorbike one of the most popular sports, in a tough battle with football. However, in that year, Ángel Nieto – who had already won 8 World Championships – could not win the world prize. He had to be satisfied “only” with the Spanish Championship in 125 cubic centimeters. And as always happens when a Spaniard competes at the highest level in a sport, the love for motorcycles had been seen in the streets since the 60s. Also thanks to the professionalism of Spanish manufacturers such as Bultaco, Montesa or Derbi. Spanish brands that competed on an equal footing with top-level foreign manufacturers such as Ducati, Moto Guzzi…or BMW. After placing you in the historical and sociological context of the late seventies, we should now focus on the bike we used as the base for the CRD101 Cafe Racer. In this case, our work has been carried out, as usual in Cafe Racer Dreams, with a BMW R100 manufactured in 1978. It belongs to the well-known /7 series -which was produced between 1976 and 1996-, and is one of the models with which we work the most. This means that our technical and mechanical know-how is much more consolidated, as we already know practically everything about the donor bike. In this case, the creation of CRD101 Cafe Racer took two months of hard work. As always, we have tried to keep as many parts as possible, being able to recondition elements such as the carburetor, the air filter, part of the chassis, the fork, the front wheel, and the fuel tank. After cleaning, repairing and painting all the parts that we were able to use from the BMW R100, we began the process of replacing the parts that could not be used again. We were inspired by previous work and give CRD101 Cafe Racer the personality of our motorcycles, but maintaining its own individuality and style. For it, we proceeded to execute the tasks that we described to you in the following paragraphs. We repaired the 1,000 cubic centimeter boxer twin-cylinder engine, making the most out of the original parts. For the exhaust pipe, we chose to maintain the typical sonority of Cafe Racer motorcycles, so we chose an anthracite gray megaphone exhaust pipe. We repainted the original petrol tank with a cream beige powder paint. The speedometer, like the lights, are made by Motogadget Tiny. 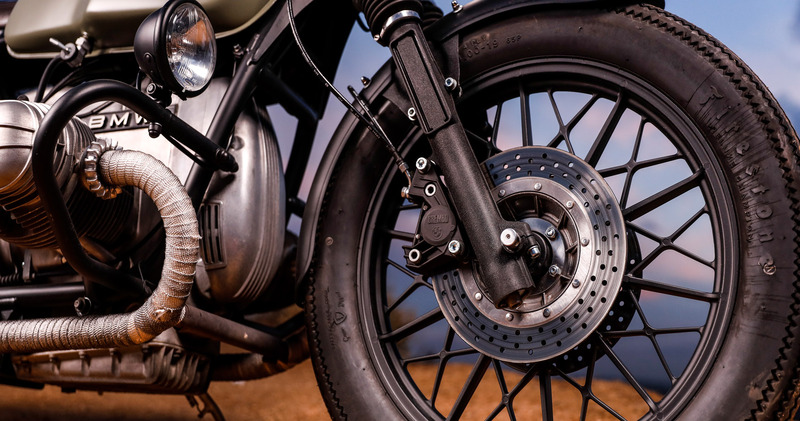 Although we have maintained the original chassis of the BMW, we have manufactured a new U-shaped subframe in order to emphasize the Cafe Racer personality typical from our motorcycles. 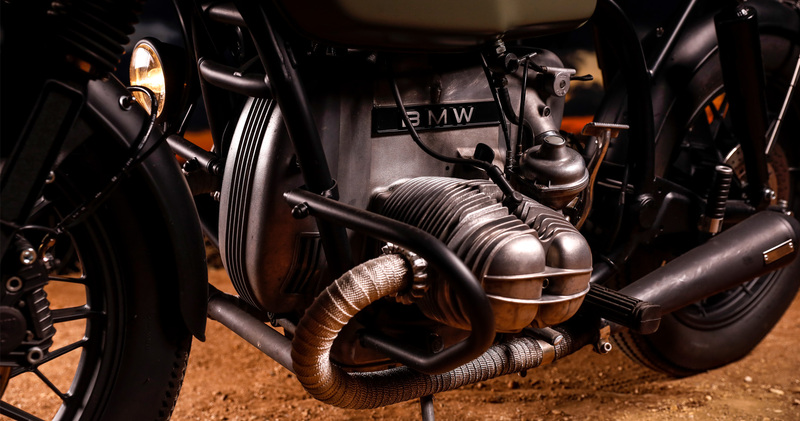 The multitubular chassis of the BMW R100 has been maintained as it is, so the dynamic behavior of this bike is very particular and you have to have enough experience not to get scared. For the suspension, we used Hagon shock absorbers, characterized by their exceptional strength and durability. While the handlebars were produced by Renthal Ultra Low and the cuffs are manufactured in our own workshop in Paracuellos del Jarama. 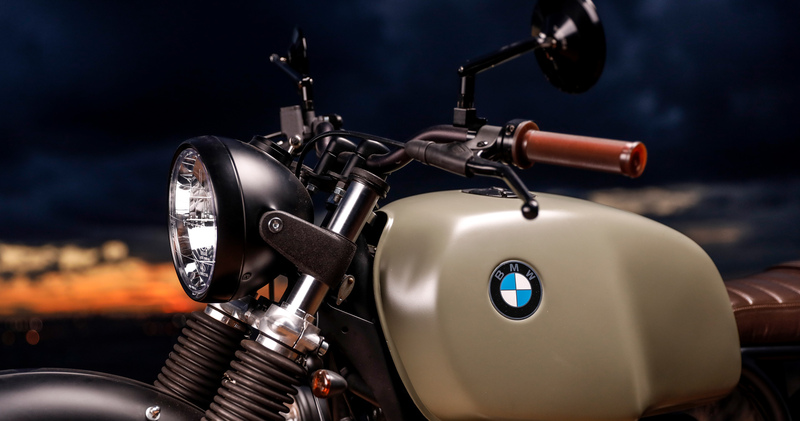 Among the most recognizable accessories of our motorcycles, the headlights we manufacture stand out for their uniqueness, together with the leather seat, which has also been produced in our workshops. Alongside this, our motorcycles are also easily recognizable by other elements such as mudguards, license plate holders and tail lamp, which are also designed directly by us. But the vintage personality of this bike is achieved, to a large extent, thanks to Firestone Deluxe tyres. We usually work with them, since they are the perfect complement for these motorcycles. They transform them into unforgettable motorcycles. One of those bikes that make you fall in love, even if you only see them fleetingly passing by in one glance. Follow this if you would like to keep watching other BMWs made by Cafe Racer Dreams.